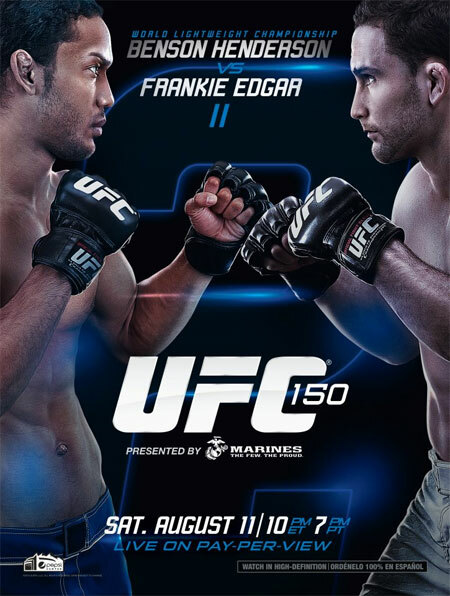 “UFC 150: Henderson vs. Edgar II” took place Saturday inside Pepsi Center in Denver, Colorado. Former lightweight champion Frankie Edgar got the chance to avenge his loss to current king Benson Henderson in Saturday’s featured attraction. A 155-pound affair between Donald Cerrone and Melvin Guillard served as the card’s co-main event. 1stRound: Lentz secures a body lock and slams him to the mat. Mitsuoka gets right back to his feet, but is still pressed against the cage. Lentz plants the Japanese featherweight on his back once again. Lentz is simply smothering him, though hasn’t landed anything significant. He takes Mitsuoka’s back and is giving him the business. It’s a wrap. 1stRound: Camus catches a kick and leads him to the ground. Pague attempts a triangle from off his back. He continues to unleash elbows on Camus while trying to choke him out. Camus gets free, but Pague goes for an omoplata. Close round to score. Camus was on top for much of the frame, but Pague was doing more damage and tried to finish from his back. Pague, 10-9. 2ndRound: Pague lands a left hook, but gets planted on his back for his troubles. Camus has over three minutes to work. He doesn’t do much outside of holding Pague down. The crowd starts to boo. Camus, 10-9. 3rdRound: Pague immediately gets him down and transitions to his back. He slaps on a body triangle. Camus reverses and is much more active with his assault than in the last stanza. He takes Pague’s back and tries a rear-naked choke. Camus, 10-9. 1stRound: Stone connects with a right, but eats a vicious right hand in return. Stone drops like a sack of rocks. Perez goes in for the kill and is laying the lumber. The fight is called, though Stone is protesting as though it was an early stoppage. It seems referee Herb Dean made the right call. 1stRound: Kuiper is winning the standup exchanges early. He gets a body lock and slams Hamman to the ground for a moment. He clocks Hamman with a right hand. Kuiper punishes his lead leg with a violent kick. Kuiper is putting on a clinic. He knocks Hamman down for a second. Kuiper, 10-9. Hamman’s leg is jacked. He was barely able to make it back to his corner. 2ndRound: Hamman is a beast. He’s basically fighting on one leg. Kuiper knows his legs are hurt and is going to town on them. He floors Hamman with a right hook. Hamman refuses to quit, despite the fact he’s eating one nasty punch after another. Kuiper drops him and the ref finally steps in to bring the scrap to an end. Hamman immediately grabs his right leg in pain. 1stRound: Bermudez unloads a front kick to the face and puts him on his back in under a minute. Hayden promptly gets to his feet. Bermudez eats a knee to the grill and falls to the canvas. Hayden goes in for the kill and takes his back. He tried an armbar, but Bermudez picks him up and slams him to the ground to get free. Bermudez slaps on a standing guillotine choke and Hayden is forced to cry uncle. 1stRound: Lawrence connects with an overhand right. He follows up with a left hook. Holloway lands an accidental kick to the groin and time is called. Game on. Holloway tags him with a left hook, but got taken down momentarily for his efforts. Blood is trickling down from the right side of Lawrence’s forehead. Holloway scores with a knee to the grill. Lawrence counters with a one-two combination. Holloway clocks him with a head kick. Lawrence takes another shot to the groin just as the horn blares. Close round to score. Lawrence, 10-9. 2ndRound: Lawrence is starting to work his kicks. He lands a spinning back-fist. Holloway clobbers him with a straight right. Lawrence’s takedown attempt gets stuffed. Lawrence beginning to beat the Hawaiian to the punch on a more consistent basis. Holloway thwarts another takedown try. Holloway gets him with a right hand and knee to the midsection. Holloway drops him with a vicious left to the body. He’s giving Lawrence the business. Game. Set. Match, Holloway. 1stRound: Roberts comes out firing, and he’s landing quite a few strikes. Not a bad start for a 4.5-to-1 underdog. Okami eats a left hook and appears wobbly. Okami gets a body lock and has him clinched against the cage. He finally drags Roberts to the mat. Okami transitions to side control. He moves to full mount, now takes his back. Okami was bringing the pain, but Roberts managed to survive the onslaught. Okami, 10-9. 2ndRound: Roberts lands a solid left hand. Okami counters with a left of his own. He takes Roberts to the canvas for a moment and almost got caught in a guillotine choke on the way down. Okami easily moves to full mount. Roberts gives up his back and the former top contender has over two minutest to punish him. After countless unanswered punches to the dome, referee Herb Dean decides to bring the violence to an end. 1stRound: Herman is the aggressor in the opening moments. For some reason he decides to play into Shields’ hands by clinching against the cage. Shields trips him to the mat with the greatest of ease. The former Strikeforce champ took his back for a moment, but Herman gets to his feet. Herman is pressing him against the fence. Certainly not the most thrilling scrap of the night, as the crowd boos after the horn sounds. Tough frame to score. Shields, 10-9. 2ndRound: Herman immediately clinches him against the cage. Shields makes him pay for it and takes him down. He advances to side control and tries a kimura to no avail. Shields efficiently working his ground-and-pound. Herman manages to get him back into his full guard. The crowd is not happy. In fact, they have been quick to pull the boo trigger all night. Shields, 10-9. 3rdRound: Shields’ telegraphed shot gets stuffed. Herman scores with an uppercut in the clinch. Herman tossed him to the ground for a second. Shields grabs a hold of a double-leg and leads his opponent to the canvas. He transitions to side control with half the round to go. Now full mount. Herman probably could have won this fight if he kept it standing, but for some reason opted to clinch with the jiu jitsu ace. Shields, 10-9, and likely swept the cards, 30-27. 1stRound: Herb Dean is the third man inside the Octagon. Solid leg kick by Henderson. And another to the lead leg. He punishes Edgar’s calf again. Edgar misses out on a takedown during a brief scramble. Henderson scores with a knee to the midsection, but Edgar counters with an overhand right. Edgar catches a kick and takes him to the ground. However, Henderson gets him in a guillotine choke on the way down. Henderson, 10-9. 2ndRound: Henderson sweeps Edgar’s leg out from under him again with another calf kick. Edgar connects with a right jab. Edgar drops him with a right hand. He locks Henderson in a front choke. Henderson gets to his feet and appears to have recovered. Edgar stuffs a takedown and lands a right as they separate. Edgar, 10-9. 3rdRound: Edgar is bleeding underneath his right eye. Henderson grazes him with a head kick. Edgar blocks a second head kick. Edgar tags him with a leg kick. And another. Henderson scores with a body kick. A typical Edgar championship round, very close to score. Edgar, 10-9 (Maybe). 4thRound: Edgar is looking to catch Henderson’s kicks, but he’s still getting hit in the process. Henderson nails his calf again. Edgar catches a kick and trips him to the mat. Henderson scores with a head kick from off his back. Edgar slaps on a guillotine choke to no avail. Edgar doing a better job of avoiding damage in the rematch. Edgar lands a body shot, though Henderson counters with three straight jabs. Overhand right by Edgar. He follows up with a leg kick. Edgar connects on a right hand. Henderson throws his hands in the air asking for Edgar to engage. Another close stanza. Edgar, 10-9. 5thRound: I’ve got Edgar up 3-1, but this could easily be 2-2. Someone better finish, otherwise there will be controversy. Edgar clocks him with a right hand. He shoves Henderson to the ground for a split second. Henderson goes to clinch and Edgar tags him with a right as they separate. Edgar turns the tables and takes his legs out with a kick. Henderson clobbers him with a big left hand. Edgar answers with two straight rights. Henderson connects with a head kick. Surprise, Edgar is involved in a close 25-minute affair… Both lightweights raise their hands in victory as the horn sounds. Edgar, 10-9, and probably rallied to reclaim his crown, 49-46.